The most talked about trick in my stand-up comedy magic show. 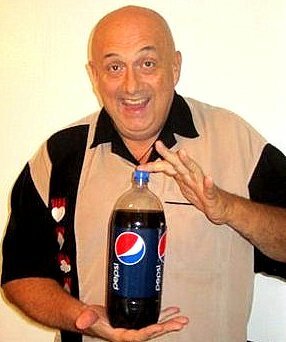 Watch this video….see me demonstrate how I make a real 2 Liter bottle of Soda Disappear. This trick can be done surrounded and in your bathing suit. I am taking orders to custom make bottles. At this time I do not have enough magicians interested in my making a video teaching them how to make them….BUT I will custom make one for you. It has to be a dark cola bottle like, Pepsi, Diet Pepsi, Dr. Pepper, Root Beer, or RC cola. Sale Price $107.00 including insured shipping within the USA. Return to magic2motivate Website CLICK HERE!